Think of the momentum you could create swimming downhill versus a steady uphill grind! The first thing we consider when coaching a more efficient stroke is: what is the swimmer’s body position? If they are swimming uphill, it is important to help the swimmer recognize that it will be very challenging to get horizontal when their legs are dragging behind them creating tremendous frontal resistance. Typically, swimmers will just kick harder to get their legs elevated. Those swimmers are wasting precious heartbeats to merely stay afloat versus gaining forward propulsion. We are absolutely in favor of a strong, steady kick but for propulsion, not for balance. Let’s talk about how you can manipulate body position so you can begin to use the legs to go forward! Extension: A longer vessel holds speed longer so the goal is to lengthen your body. While extending, think of the motion of raising your hand to answer a question…you’re just trying to get an inch or two longer. When swimming freestyle, as you enter the water I encourage a slight rotation onto the hip and shoulder of the entering hand combined with extension forward and slightly downward. Instead of just placing your hand in the water during entry, extended it forward as if raising your hand to find that extra inch or two of length. Pressing the “T”: This is an old school swimming term that we first heard from swimming guru Bill Boomer. Many elite swimmers have been coached under this philosophy to “lean or press into” their stroke. Picture the “t” with your lungs at the bottom, your shoulder are the cross of the “t” and your head is the top. With your head, you literally slide it forward on your spine so that your nose and forehead are pressing downward into the water (like a chicken slides its head forward on its neck). Most swimmers swim with their head much too high. When looking at a swimmer from above, we should just see the very crown of their head exposed – the rest is underwater! When taking a breath, keep pressure on the water with your temple, don’t lift your head away from, or out of, the water. The ideal would be to keep one goggle in the water during the breath. Swimming with a snorkel is a great way to practice the ideal head position because you won’t have to take you head off the line for a breath. In regard to the cross of the “t”, the press, or lean, of your chest and shoulders needs to be continuous– even as they rotate from side to side. So, if you are kicking flat on your stomach, you would press your sternum into the water but, once swimming, the pressure would transfer to your armpit of the pulling arm, back to the sternum and then the armpit of the opposite arm that is now pulling. This is truly that “downhill” feel. Front Quadrant swimming: Think of everything in front of your shoulders as your “front quadrant”; we believe it is very important to always have some length/weight in that front end besides just your head. A lot of people swim with “helicopter arms” – blades that are always opposite each other. We like more of a catch up stroke: as one arm is in the catch position, beginning to pull, the other is just entering. This gives both length and weight in the front end to help to balance out the weight of the legs. Superman kicking – Put on your snorkel and ditch the kick board for this balance drill! On your stomach kick with both arms extended parallel to one another – feel your shoulders rotate forward, toward your ears, as you extend. Lean into your kick as if Superman is in the early stages of starting a decent. Engage your core by pulling your belly button back toward your spine, this will also flatten your back. Pay attention to your head position – press the top of the “t” by sliding your head downward so that your ears are squeezed between your biceps. Ideally, in this position, the back of your head, your shoulder blades, the skin of your suit and your feet will be riding high on the surface of the water. Full catch up – before you allow yourself to pull with your right arm, make your left arm fully finish the cycle and have the two hands meet in front side by side or parallel to one another. This drill of course flattens you out tremendously and slows your tempo but, you’ll be amazed by the horizontal position of your body on the water. It is also a great drill to practice setting up a good catch and feeling the forward movement you gain by applying pressure backwards on the water with your pulling arm. Take your time with this drill and recognize how your kick is now driving you forward rather than balancing your legs. 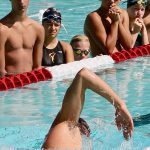 Breathing side catch up – this drill is done exactly like above but you only use a catch up stroke while taking a breath. So, if you are breathing to your right you must let the left hand wait for the right hand to meet it in front before the left arm can pull. You do not have to wait for the left hand to meet the right before you pull because you didn’t take a breath. This stroke looks a bit gallopy or lopsided. In general, it is theextended arm, during the breath, that usually pulls too soon and therefore, we have no length in our front quadrant during a breath.Imagine for a moment: no length in front and your head lifting up for a breath – that is like the child on the lower end of the see-saw jumping off and the child in the air comes crashing down! Eventually, you’ll want to swim with an “almost catch up” stroke so you can create a faster tempo and a more rotationally balanced stroke. If you practice these drills enough, and pay attention to your body position, you will have the ability to ride the water much higher and build momentum throughout a race!